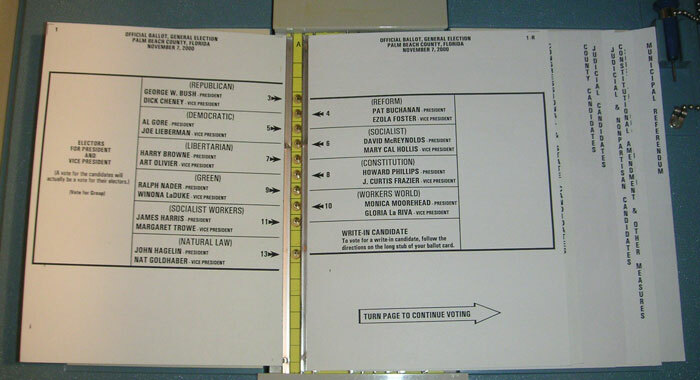 The Florida Butterfly Ballot. Photo by Steve Krug, used with permission. The email lists have been abuzz with discussions of the usability issues in the Florida ballot. A common question asked was why a ballot design with so many obvious ways of failing its users attracted no attention before the recent U.S. Presidential election. Users don’t realise that they have a right to complain if they can’t understand official forms. Users think that official forms are difficult, and that they must be that way. In general, people don’t understand that it is possible to improve forms. Bad forms are regarded as a fact of life, like bad weather. Most people, faced with an official form, simply don’t make a mental note of what happened. They just think, “How can I get this thing done and out of my life as quickly as possible?” Users don’t have a reason to remember, nor are they required to remember their interaction with official forms. This makes it hard to find out what really happened if you ask them later. People complain when the effort of making a complaint has some sensible relationship to the chance of the complaint making a difference. And even then, they frequently complain to the wrong person. For example, a voter who found the form a bit difficult might complain to the people right there in the voting area–people who probably have no way of dealing with that complaint. It isn’t remarkable that the Florida ballot is a bad form causing user errors. There are probably millions of incorrect ballot papers all over the USA. The vote is counted by an inexpensive or volunteer staff, brought in at rare intervals and asked to process the ballot as quickly as they can. They’re not paid to ask questions about why there are so many bad ballots. So they don’t. And even when you know the error rates, there usually isn’t much reason to investigate why the errors are happening. Palm Beach County had the highest error rate of any county in the USA in the 1996 election, but it didn’t make a difference to the result in that election, so no one had any reason to find out what the problems were. Unless there is a reason to check for errors and think about why they happened, the cause of errors will never be found. The message for usability people—if you are changing an existing process, it’s easy to make the mistake of thinking that because it is working now, that it is working well. Take time to find out all the details of what is really happening. Think about whether the intended change will make a minor problem in the current system into a major issue in the new system.